“Give me the pink one. It’s my lucky lathi. Now let’s get them to confess”. Vetrimaaran’s film takes a journey through the lawless side of law enforcement, where results matter and truth is often unwelcome. Adapted from M. Chandrakumar’s novel which was inspired by his own experiences, there is a relentless sense of doom pervading this story. Don’t get too attached to anyone! Four Tamil men have come to Andhra Pradesh to work, sleeping rough in a park to save money. One night they are all picked up by the police. They are brutalised over and over but not told what they are suspected of doing and what they must admit to. It’s all a game to the cops but no one told Pandi, Murugan, Kumar or Afsal what that game is. Afsal (Silambarasan Rathnasamy) is the youngest and weakest. Frightened of being hurt, and generally shy and inarticulate, Afsal triggered the arrests with a confession under duress and wavers most when under pressure. The four boys stick together and try to find a way out, trusting that their innocence will be recognised. 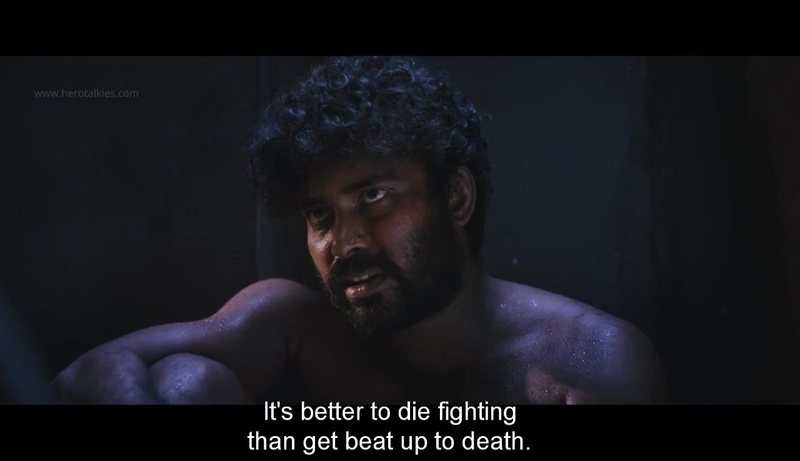 Pandi (Dinesh Ravi) and Murugan (Aadukalam Murugadoss) are the stronger ones, with Pandi the more cynical and Murugan the more placid. Kumar (Pradheesh Raj) is injured badly early on and is a quiet, tense presence for most of his scenes. The boys go on hunger strike and it seems to work. They are released, given money and told to come back to the station to sign a statement. They stop for a meal, eventually laughing at their strange fortunes. But when they go back, the sadistic Superintendent (Ajay Ghosh) says he couldn’t hit a starving man so he tricked them into filling their bellies. The beatings resume, more vicious than before. I was struck by all the energy that goes into forcing confessions when maybe with the same expenditure of effort they could track down the real criminals. There is a discussion about finding someone else to take the fall but the boss is worried after all the injuries that the men will complain so he decides they must be found guilty. Eventually all the pressure works, especially the emotional blackmail from Pandi’s boss who knows it’s a set-up but encourages Pandi to take the easy way out for everyone’s sake. Including the police. These poor guys are expendable. Pandi refuses to make a false plea once he is in front of a magistrate although his Telugu is not up to the finer points of his defence. Luckily for him there are Tamil Nadu police in another court so one is called upon to translate, and even more fortunately he recognises Pandi. Inspector Muthuvel (Samuthirakani) explains the boys have jobs, never admitted fault, there is no evidence, and they’ve been beaten up for days on end. The magistrate knows Superintendent Rao has form for closing cases with false evidence and the boys go free. Unluckily for Pandi and friends, the Tamil cops need their help in return. Sure enough, they help kidnap a high profile money launder KK (Kishore) from the courts. Back in Tamil Nadu, Kumar gets dropped off along the road but the others are taken to the station along with KK. KK tells Muthuvel that the last move in this game will be to tie up all the loose ends, like Muthuvel himself. And KK is a very smart man. About to leave, the guys are asked to clean the station building before they go. The ominous music says that was a bad idea, and I think Pandi knew it too. Vetrimaaran mostly sticks with realism, creating a sense of the world just out of sight of the mainstream. The dark side is literally dark, with much of the film shot in night time and dimly lit interiors. The scenes are beautifully composed and I felt immersed in Pandi’s world, and the feeling of being entangled and lost. The spike of fear when the cops start torturing people is visceral, the relief when it stops and the terror of those waiting their turn also feel real. There is a foray into black and white for a couple of climactic scenes that struck me as annoyingly filmi. I wasn’t sure if it was censored because of all the gore or just cleverness, but regardless it was too tricksy. Other more successful visual metaphors were derived from the core of the drama – the movement between light and dark, between high and low places, people up to their necks in muck wading through sewers. The pace drags a little when the boys are hanging around doing the cleaning, and there is a little too much helpful exposition to get everyone on the same page, but these are minor issues. Dinesh Ravi carries most of the film as Pandi was the enquiring mind, the calculating observer, and the loyal at heart. His reactions and interactions with Samuthirakani give the story a centre and conflict that held the other strands together. Samuthirakani has gravitas and a wry humour that sparks up when Muthuvel is at ease. He is the cop who knows what is right, wants to be clean, but is coerced by his higher ups. Kishore is also impressive as the sly money man who can’t believe he will run out of friends or dollars. The dialogue is often sparse and meaning is layered through action and reaction. This is a man’s world. There is a budding romance (Anandhi as Shanthi), and a female cop (Misha Ghoshal) who deliberately forgets her phone so Pandi can call for help and that is it. All the supporting performances are good, but there are so many fleeting character appearances that the police dissolve into one huge despicable khaki organism. I am not really surprised that the film failed to make the Oscars. A dog eat dog world with no hope of justice, and with the police at the heart of the darkness, seemed like a hard sell. This is an accomplished film with some exceptional performances. It’s not an easy watch due to the casual brutality. It made me question why such a topic is still so current. And there is no moral or redemption to send you whistling on your way. Just death, lies, greed, and a promise of more of the same. 4 stars.